Music, dancing and singing were an important part of fashionable Victorian social life and balls such as this one at the Floral Hall in Covent garden were frequent events. A lot of preparation went into organising a successful ball: the hostess needed to order food and drink, hire musicians, decorate the venue, and ensure that invitations were sent in advance to an appropriate mixture of individuals. 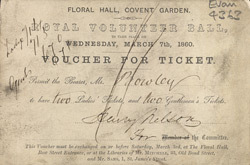 This ticket reads: "Permit the Bearer, Mr. Rowley to have two Ladies' Tickets, and two Gentlemen's Tickets. Harry Nelson for the Committee."